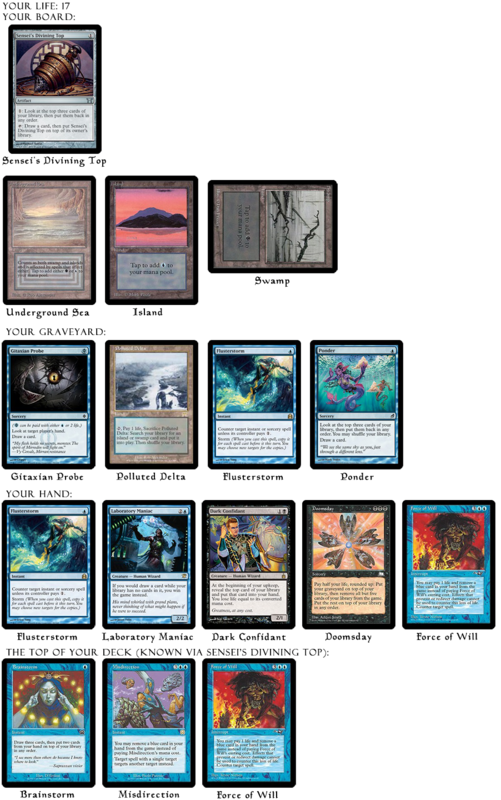 Your opponent is on a very strong combo deck in OmniTell, but you are not deterred. You are also on a combo deck, but one which features more countermagic and disruption. This will be a game of inches, but one that you should win if you plan properly. You took the first game of the match, and your opponent is not about to go down without a fight. You brought in a pair of Dark Confidants and Cabal Therapies for some extra draw and disruption. It is your opponent’s turn 4. 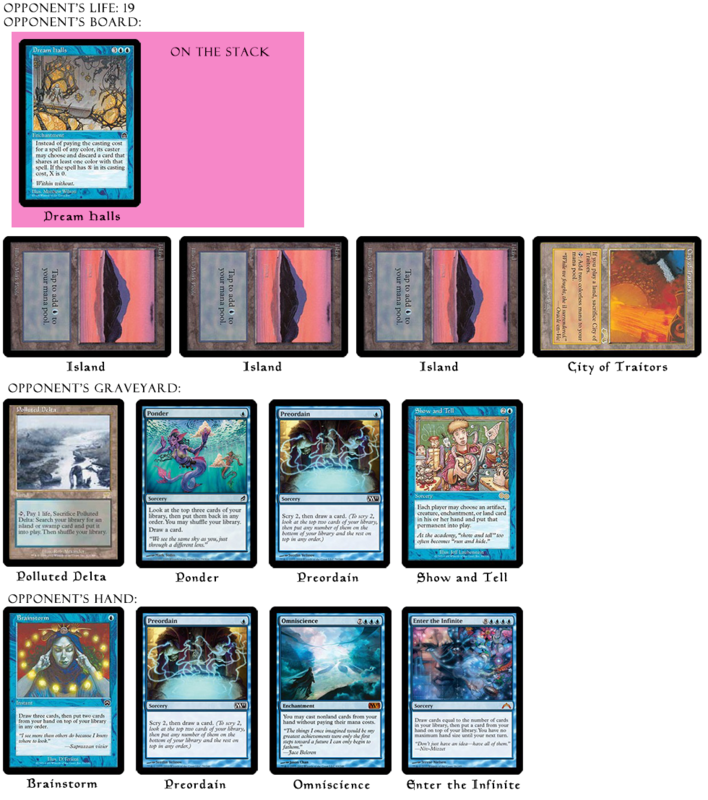 You know your opponent’s hand because you Gitaxian Probed them last turn, and you know the 3 cards on top of your deck because you activated Sensei’s Divining Top. Your opponent has just tapped out to put Dream Halls on the stack. Normally, that would be a card you should counter. Yet, given the unusual circumstances of the game, and the fact that your mana is limited (you missed a land drop), you may be able to use Dream Halls to your advantage. Your opponent is clearly intent on casting Omniscience and Enter the Infinite off of Dream Halls. However, they know that you may have access to Flusterstorm (having already played one this game and last game), so they could potentially wait a turn to cast Enter the Infinite to play around this. Bear in mind that their Brainstorm could also uncover a Pact of Negation, which they have maindeck. Preparing for the worst case scenario, what do you do? The solution for this puzzle will be posted next week. For more mind-bending Doomsday Puzzles, be sure to check out Doomsday: The Puzzling – Double Deathrite Conundrum, as well as So Many Insane Plays – Doomsday: The Puzzling – Five Puzzles to Blow Your Mind! There are 5 levels of increasing difficulty, and this puzzle above builds on those examples and lessons. Have fun!